If you're currently suffering from the common cold, or even seasonal allergies, you know how frustrating it can be trying to get over them! Trust me, I know; ya girl is on day 3 of being under the weather & it is surely not fun. Personally, curing my cold with medicine is always a last resort. Sure, I'll take a little advil to get through class without a persistent head/body ache, or after a REALLY fun night, if you know what I mean (aka hangover). But when it comes to getting over a cold and speeding up the recovery process, I like to try and find other things to help flush my body of the toxins brought on by bacteria/viruses. Firstly, because I'm a health nut and believe food is the best and only real medicine. And secondly, because I feel that taking medicine only helps to temporarilyrelieve symptoms, not get rid of them completely. I'm sure everyone is familiar with the classic American "upset tummy diet," otherwise known as the "brat" diet which is made up of bananas, rice, applesauce, and toast. However, now that we're more educated about nutrition and have discovered a wider & better variety of superfoods, I wanted to share some of the ones that can help you beat your cold! When I'm fighting a cold, I'm never really in the mood to eat big or cooked meals. Usually, I just stay hydrated by drinking tons of water throughout the day, sip on some tea, or drink a smoothie in bed. That being said, instead of sharing what "real foods" to eat, I wanted to share the best types of tea to drink, essential oils to diffuse, and superfood's to incorporate into your diet while trying to recover! Lets get into it then, shall we? Both ginger and turmeric contain anti-inflammatory chemicals that'll be sure to help with swollen lymphoids or other glands. Ginger also supports digestion and will help flush out any toxins in the body! Whenever I'm experiencing swollen glands, congestion, or an itchy throat, I whip up a turmeric/ginger elixir or golden milk tea and sip on it throughout the day. I notice on the days that I drink it, I'll usually wake up the next morning a lot less inflamed or swollen. Garlic is one of the most powerful tools in helping to reduce inflammation because it contains anti-inflammatory compounds called organosulfur. Simply adding it to meals, or even chewing on it can assist in ridding your cold. Frankincense is a type of essential oil that will help clear up phlegm in the lungs and nasal passages, while also reducing inflammation in both those areas. Diffuse it, rub a few drops on and around your nose, or even add some drops to a cloth, hold it up to your nose, and breath it in! Peppermint, as I'm sure most of you know, has a soothing effect. One of it's main ingredients, menthol, can both help soothe any irritation while also clear out passage ways for phlegm to pass through, acting as a decongestant! You can add in some raw honey to coat your throat and alleviate any pain, or after drinking your tea, gargle with salt water to help pull out bad bacteria. Echinacea is an awesome herb that can help combat the common cold, upper respiratory infections, and just overall strengthen your immune system. I like to drink it as a tea, however, you can take it in pill form for a quicker effect. Lastly, like I said, peppermint is soothing; so, diffuse some peppermint essential oils or even rub some on your neck to get some pain relief. Skullcap is a lesser known herb that is so powerful when it comes to fighting off a headache. Skullcap tea is highly calming and was widely used in Chinese medicine as a sedative or treatment for insomnia. It can help combat anxiety and relax the central nervous system, reducing the pain from tension headaches. Black sesame seeds are full of some of the most essential nutrients like magnesium, calcium, copper, iron, and phosphorus (and the list goes on.) Because they're so rich in things like calcium and magnesium, they help to regulate blood pressure and reduce headaches. Lavender essential oil is one of the most commonly used essential oils not only because it smells lovely, but also because it has an awesome calming effect. You can even combine lavender and peppermint oils and inhale them to really get rid of any headaches you might be having. Ginger is definitely one of those SUPER superfoods. There's so many now that there has to be super superfoods, am I right? Anyways, ginger tea helps aid digestion and it also helps relax the intestinal tract so things can pass and your tummy can settle. Chicken noodle soup is one of those things like the brat diet that all of us Americans have lived off of while being sick at some point in our childhoods. Heck, it's still the number one thing my mother suggests I eat when I'm sick, lol. However, the real super ingredient in the soup is the broth. Drinking bone broth while sick will help replenish your body of electrolytes and also warm your tummy up when it's feeling achey. Chamomile essential oil will help calm and relax your entire body. Rub some directly on your tummy or diffuse it! Both Sage and Apple Cider Vinegar are great things to incorporate into your diet as a natural decongestant. Enjoy sage tea combined with apple cider vinegar, or have it alone. 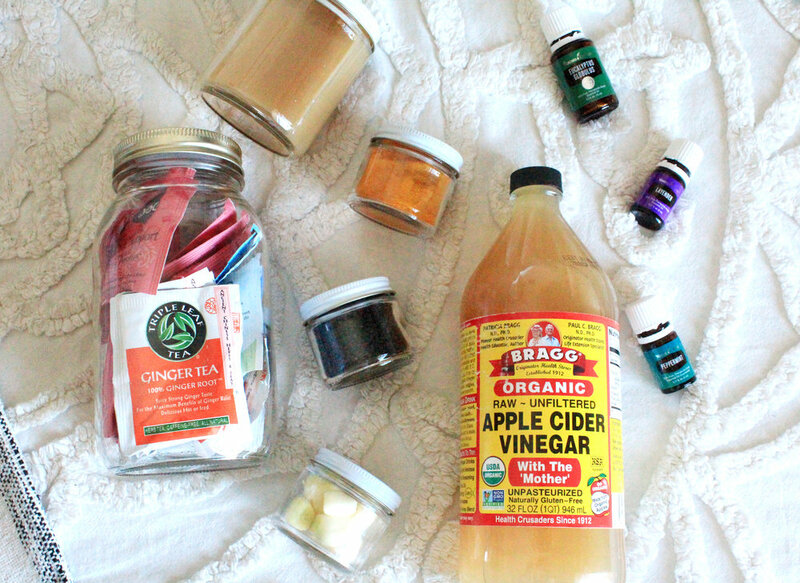 You could also combine sage tea, apple cider vinegar, lemon, and a dash of cayenne pepper to really clear your nasal passages! Eucalyptus oil is like the more potent and natural version of that gooey Vicks Vaporub stuff we all had our parents rub on our noses and chests as kids. Rub it around your nostrils, or add some drops to a piece of cloth, and inhale it! So, there you have it! The best teas, essential oils, and superfoods for every common cold symptom. Everything that I share on my blog are either things or tips that I actually use on an everyday bases or in situations, like now, where I'm sick. So trust me, including one or two of the things I mentioned in your diet will for sure help speed up your recovery process like they do for me! If you have any home remedies for getting over a cold, please share! After all, that's what my blog is all about, sharing my tips and tricks and hearing about yours, as well. From one sickling to another, feel better!